All over Neopia, the same thing is happening. The days are ending that little bit sooner; the air is that tiny bit cooler than it was a few weeks ago; the leaves on the trees are gradually becoming redder and redder. Summer has come to an end, with autumn (or fall) taking its place. For some, this is welcome news – no more scorching hot days, no more incessantly parched throats and no more sunburn! However, for many Neopians, this isn’t such good news – it can be depressing watching all of the remnants of summer drift away. To add to that, the end of summer means the start of school again! Hopefully, this article can give you some ideas about how to cope with autumn. The best thing to start with would be your Neopet’s clothes. He or she can no longer wear his or her I Club Sloth Grundo T-Shirt, or your Banana Mynci Shorts (although I’d question why you’d want to wear the latter anyway)... However, there’s no need for you to fear! The coming of autumn means that there’s a whole new array of cool, stylish and functional clothes that you can wear and be the coolest Neopet on the block. For the girls, there’s the School Girl Jumper. It looks good on just about any (female) Neopet, and keeps you warm, despite that chilling wind that blows past, or that misguided school trip to Terror Mountain. For the boys, there’s the Seasonal Turtleneck Jumper. The Advent Calendar may have originally given it out, but this easily affordable item shows everyone that you look good in winter clothes, whatever the season. Considering that it’s no longer the shorts season, there are a whole host of trousers that your Neopet can wear, keeping his legs or flippers warm on those cooler autumn days. Feeling funny? Blumaroo Jester Trousers might just be for you! Feeling adventurous? Some Korbat Aviator Trousers could be helpful! My personal favourite are the Patchwork Trousers. Be the talk of the town with those snazzy patterns; you’ll certainly stand out from the crowd! If you’ve not got any Neocash to spend, then some practical Khaki Trousers are also a good option. And to keep your Neopet’s feet, paws, talons or fins warm, you’re going to need to buy some shoes. Blue Shoes are the popular option – they’re simple, but cool at the same time, as well as cheap. If you want to stand out a bit more, then you may prefer to purchase something like Fun Green Lenny Shoes, or Stylish Volcano Run II Shoes. Once again, there’s a huge variety of footwear for your Neopet, so make sure you have a good look at all of the different options before you buy! 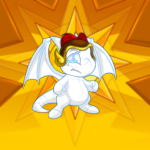 Finally, you need something to complete your Neopet’s look. It needs to be something flashy and quirky, something that really sets you apart from anyone else. It needs to reflect your Neopet’s personality. Neocash can buy you a pretty Autumn Leaves Background, or a Poppable Bunch of Balloons (make sure they don’t get blown away by the wind)! Alternatively, you can spend your neopoints on a Techo Kite, great for those gusty days. If that’s not your sort of thing, then how about a mysterious Wooden Warf Totem? However, I think there’s nothing cooler than a Woolen Scarf or Censor Bar Glasses. 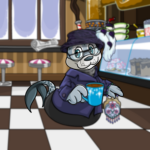 I’m sure that you’ll have some ideas about what to dress your Neopet in for the autumn now, so it’s probably time that I moved on to another important topic: the Neohome. Just a few simple touches can really make your Neohome look quite snazzy. Let’s start with the garden: after all, that’s what most of your fellow Neopians will see! For foliage, there are a fair few different choices. If you’re looking for something big then a nice Autumn Birch Tree might be right for you. Those orange leaves and white bark are actually like that all year around! If your garden is already something special, then perhaps the smaller touch is what you want. An Autumn Blush or even just some Autumn Sunset Daisies can add some new colours to your display. Plants are good, but that’s not all it takes to create a great yard for all to see. Placing a few Autumn Garden Torches will definitely brighten up your place in the night, perhaps even making it that little bit more beautiful. For some character, why not try putting a Mystery Island Tiki Statue in view? Then again, if tranquility is all you want, then a Stylishly Simple Pond should definitely add an air of calmness to your surroundings. With your garden all sorted out, it’s time to make a few alterations to your Neohome itself. Now, there are two ways you can go about doing this: you can just make a few small changes to show that you care, or you can go all-out and completely transform your Neohome. Make sure you choose wisely, because items for your Neohome can often be fairly expensive, and you wouldn’t want to go wasting a lot of neopoints. If you’re only interested in small changes to your humble abode, then why not put an Autumn Leaf Wreath on your front door? It’ll provide a seasonal welcome to any visitors you may get. Some Basic Orange Floor Tiles, or a Blue and Orange Drawer are also subtle touches to allow your Neohome to blend in that little bit more with your garden, which is hopefully in full autumnal bloom. There are loads of choices for you if you’re feeling extravagant, also. Firstly, you’ll need to pick a nice colour scheme to match the season – that means lots of oranges and browns. Though plain, Orange Haunted Woods Wall Paint is a very complementary colour, and a great place to start from. Moving on to furniture, there’s a whole range of “Orange Grundo” furniture, which you can experiment with (some of it’s as cheap as one neopoint)! Items made from the autumn trees such as an Elegant Wooden Desk can really add a natural feel to your Neohome. Finally, for a measly amount of Neocash you can purchase some Shenkuu Fencing – a perfect last touch to complete your Neohome. Overall, I’ve barely touched the surface of the small things you can do to help you and your Neopet celebrate the end of summer and the coming of autumn. You shouldn’t feel obliged to spend vast amounts of neopoints doing any of the things I’ve suggested; what’s important is doing what feels right for you. Thank you very much for reading; I hope this helps!